[ba‘s text:] This croquembouche is constructed with cheesy gougères [baked savory pastry, made of choux dough mixed with cheese] and an herbed cheese filling. It’s the showstopping holiday appetizer you didn’t know you needed. 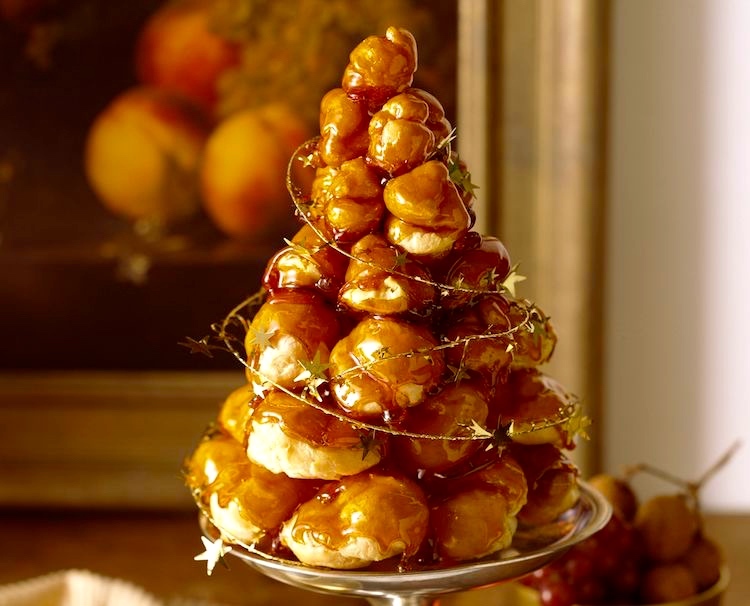 Ok, first the eccentric croquembouche, then those challenging culinary projects for the holidays. 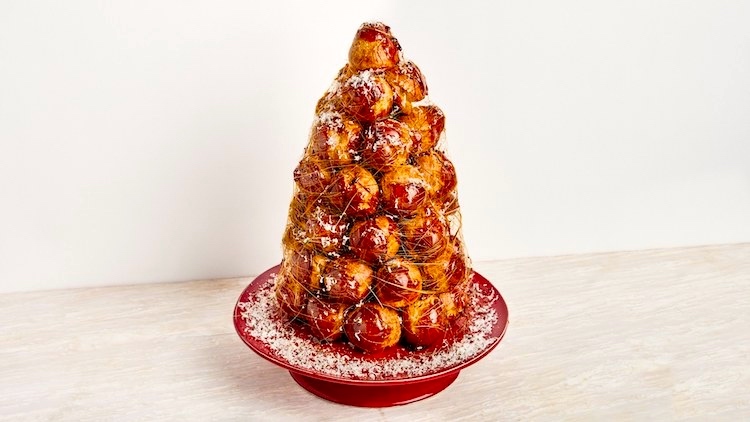 The cheesy croquembouche.You didn’t know you needed this, but ba is sure that you do. You could, of course, just buy some cheap commercial cheese puffs and put them in a bowl for guests. Or you could go to the trouble to make cheesy gougères (if you use genuine cheese from Switzerland, you could have gougères de Gruyère, or in English gruyere gougeres), which are a bit of trouble, but very tasty (I am fond of them). Or you could go one step further and make cheesy gougères (often also called cheese puffs) and stuff them with a cheese filling. Or you could do all this, and make those filled cheesy gougères into a conical tree-like work of art that your guests will have to disassemble to eat. Obviously you should go for the croquembouche; all that effort makes them better, right? 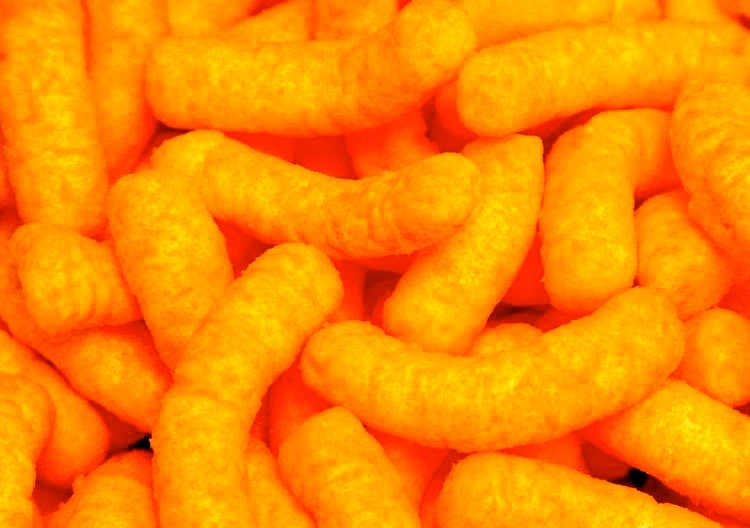 Cheese puffs, cheese curls, cheese balls, cheesy puffs, corn curls, or corn cheese are a puffed corn snack, coated with a mixture of cheese or cheese-flavored powders. They are manufactured by extruding heated corn dough through a die that forms the particular shape. They may be ball-shaped, curly (“cheese curls”), straight, or irregularly shaped. Another version was created by the Elmer Candy Corporation of New Orleans, Louisiana in 1936. The sales manager Morel M. Elmer, Sr., held a contest to name the new product “CheeWees”. A croquembouche or croque-en-bouche is a French dessert consisting of choux pastry balls [US: cream puffs] piled into a cone and bound with threads of caramel. In Italy and France, it is often served at weddings, baptisms and first communions. … A croquembouche is composed of profiteroles piled into a cone and bound with spun sugar. It may also be decorated with other confectionery such as sugared almonds, chocolate, and edible flowers. Sometimes it is covered in macarons or ganache. Are you counting down to the weekend and/or a nice long break from work? You’re probably planning on going to a museum, cleaning your house, or catching up on your favorite TV shows. But why not challenge yourself in the kitchen with a day-long (or even two-day-long) project? From a beautiful birthday cake to smoked brisket to tacos al pastor, here are some serious projects to help exercise your cooking muscle when you have a little extra time to kill. A recollection from my Princeton undergraduate days as a math major (in what was probably the world’s greatest math department at the time). Starting my sophomore year, almost every holiday of more than a couple days’ duration — Christmas break, semester break (in January), spring break — came with a very challenging take-home exam, the idea being that the breaks were full of uncommitted time, without demands from other courses, that should be used for intensive efforts to advance our abilities in mathematics. We were, after all, in training to become mathematicians, and everything else was just a diversion from this single purpose. It was hard for me, since I also needed to work (at the Reading Eagle newspaper) during these breaks, to earn money to support myself at Princeton. My parents got used to seeing very little of me when I was, in principle, “home” and “on vacation”. The sad thing about this is that most of what I learned in math has vanished; I could no more do a take-home exam in differential equations now than I could fly. But what happened in my philosophy courses and the two linguistics courses Princeton could then offer changed my life. And the two music courses I was able to shoehorn into my schedule (against the objections of the math department, which viewed such things as frivolous) were important, as well as the material I studied in a freshman survey course on modern European literature (in translation) and the works I read in German, Russian, and Sanskrit classes. (These were all part of an education in the humanities and arts, to go along with my strong background in math and science.) Obligatory underclass “distribution” courses, which I took in sociology and anthropology, brought me into a completely new world and helped move me towards a career as a sociolinguist and a scholar of gender and sexuality. And my time at the newspaper changed my life profoundly, in ways I can hardly comprehend; it’s where I became, very quickly, a grown-up. If I could go back, I’d spend a lot more time at the paper, not on take-home exams in math. As for demanding culinary projects, Ann and I undertook quite a few of those, but not for the sake of building up kitchen muscle. We did these projects for the sake of the results — wonderful dishes we couldn’t easily get commercially, or could do better making at home. Even so, these were relatively rare projects; most of our cooking was in fact simple, though not necessarily conventional: mustard-baked eggs, Wiener schnitzel and its poultry, pork, and beef cousins, stir-fries, grilled cheese sandwiches, fried cornbread, hot and sour soup, stews, fruit compote, baked apples, simple tarts, and so on. This entry was posted on December 25, 2018 at 11:10 am and is filed under Holidays, Language and food, Metaphor, My life. You can follow any responses to this entry through the RSS 2.0 feed. You can leave a response, or trackback from your own site. My favorite cheese puffs were Planter’s Cheez Balls, long since consigned to the grocery aisle of history.